Because of their heavy weight, workers tasked with loading and unloading hay bales are at risk for injury. Hay bale-related accidents can result from poor stack configuration or shifting during transportation that causes falling or collapsing bales. By storing hay in an open-sided fabric-covered building from Winkler Structures, farmers can reduce the odds of injury from hay bales. Winker Structures have a wide opening so trucks can be backed into the space, reducing the distance hay needs to be carried and minimizing the risks to worker safety. Additional height clearance can be added with pony walls or I-beams. Additionally, concrete slabs can be added to buildings from Winkler Structures to provide a smooth surface for safer and easier unloading. 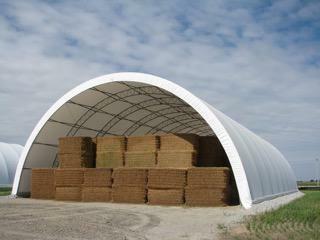 Contact Winkler Structures today to learn more about customizable fabric buildings for your hay bale storage needs.